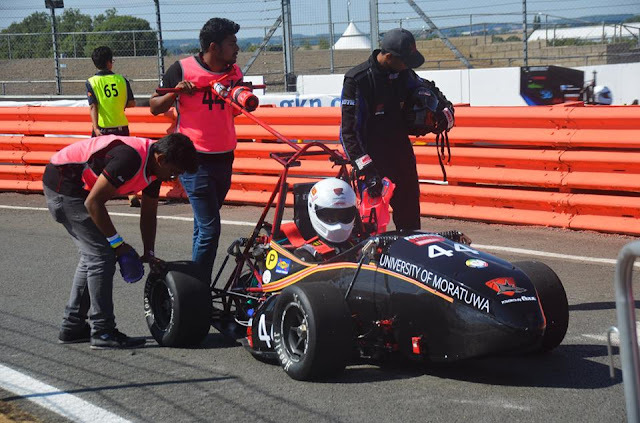 And once again Team SHARK brings glory to the University of Moratuwa by becoming 2nd in Asia at the recently concluded Formula student UK competition which is Europe's biggest engineering design competition, which was held at the Silverstone Circuit from 13-15 July 2018 for its 20th consecutive year. The competition was organized by the IMechE, Institute of Mechanical Engineers with the participation of over hundred university teams from more than 30 countries across the world who competed to design, build and race the best single-seater open wheel race car. And Vidura Widanapathirana, a third-year mechanical engineering undergraduate of the University of Moratuwa who is also an assistant engineer of the Team SHARK 2018, sat down with us to take us through the journey of Team SHARKs. Hello Vidura, Congratulations on Team SHARK’s recent achievement. Before we get into details can you please tell us what Team SHARK is and the formation of the team? Thank You. 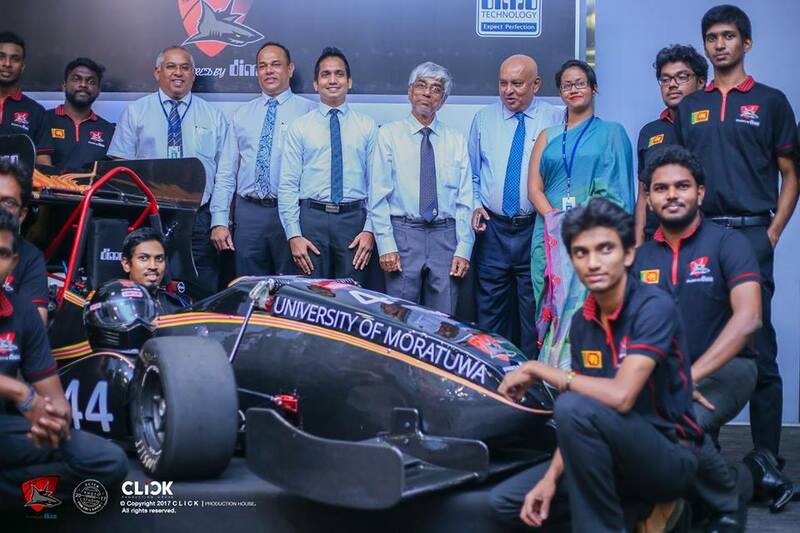 And yes, Team SHARK is a team from the University of Moratuwa that represents Sri Lanka in Formula Student UK, the world's most established educational motorsport competition. 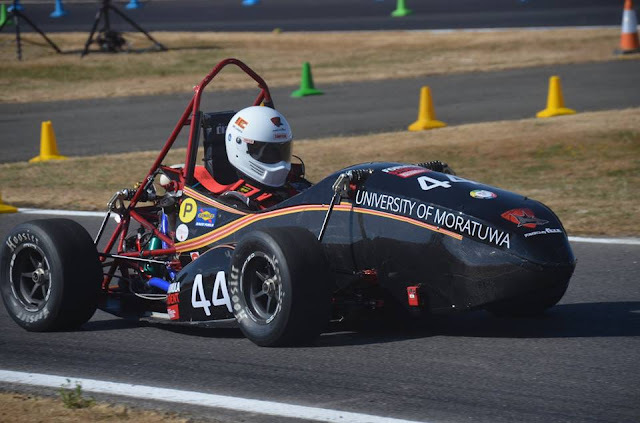 In 2016 two 2nd-year undergraduates at the Department of mechanical engineering of University of Moratuwa (Harshana Kelasha & Rajive Wisidagama) who really had a passion towards motorsport started this team with 16 other undergraduates at the same department. They had the vision to build their very own racing car but the task was not easy at all. The designing and the construction of the car was a tedious process and financing such a project by themselves was nearly impossible. The initiation of the project would not have been possible if it wasn't for the generous support of DIMO, Diesel & Motor Engineering PLC who funded the project entirely, not only costs of material and manufacturing of the car but also for the accommodation in UK, airfare of the team etc. DIMO has always been there as the sole sponsor for Team SHARK since 2016. And Team SHARK from the University of Moratuwa is the only team that represents Sri Lanka at this prestigious event, since then. The team of 18 undergraduates managed to win the 3 most significant awards at their first ever FSUK event in 2016. How does Team SHARK find themselves a committed set of individuals and what is the structure of the 2018 team? The team consists of undergraduates of the Department of Mechanical Engineering of University of Moratuwa. Every year there is an interview process done by a panel consisting of our lectures and also representatives from DIMO where they select a certain number of mechanical engineering undergraduates who then go through a probation period working with the team. And then the final recruitment is done in a few weeks’ time. Then they work day and night with dedication in order to bring out the best possible formula student type open wheel race car. And this year team consists of 12 fourth year undergraduates and 7 third year undergraduates. What was the recent competition? And what are the achievements? FSUK (formula student UK) event basically divides into two main categories, Class 1 & Class 2. Class 1 is the main event, where teams compete with the cars they have designed and built. Class 2 is a concept class for teams who only have a project and plan for a Class 1 car. We compete under Class 1 category. Class 1 category again divided into 2 main events. The static events and the dynamic events. There are 3 static events called Engineering Design event, Cost & Manufacturing event and Business Plan Presentation event. In the Engineering Design event they evaluate the design of the car and mathematical models which we have used for the car, Cost & Manufacturing events evaluate the team’s ability to prepare an accurate engineering and manufacturing Bill of material for the complete vehicle as well as evaluate the general cost and manufacturing knowledge of the team and Business Plan Presentation event evaluate the team’s ability to develop and deliver a comprehensive business model which demonstrates their product – a prototype race car – could become a rewarding business opportunity. After evaluating all teams presented during the competition and score is given. When speaking about dynamic events it’s especially need to mention that prior to the dynamic events, it is compulsory to pass noise test, chassis scrutineering test, brake test, tilt test, safety test and technical inspection test which normally refer as static tests. While many teams struggling to pass these tests, we managed to pass those with flying colors. Dynamic events again divided into 4 categories. Skid pad event, acceleration event, autocross event, endurance event. The skid pad course consists of two pairs of concentric circles in a figure of eight pattern which evaluates the car’s cornering ability, Autocross event evaluates handing and performance of the car during 1km length track. Sprint event evaluates acceleration performance in 75m straight road, 22 km Endurance event evaluates the reliability & handling and fuel efficiency event evaluates the fuel efficiency of the car. And it’s a great pleasure to mention we (Team SHARK) placed 11th on Skid pad event, 20th on Design event, and 26th on acceleration and 19th on Endurance. And especially I need to mention that we could be the 1st Sri Lankan team who completed endurance event. While securing 33rd position overall out of hundred teams on FSUK 2018, Team SHARK could become 2nd in Asia. This is a significant achievement for Team SHARK. Can you briefly explain the designing and construction process of the car? Designing was done by the team members themselves. Even the smallest detail. Team members were divided into several subsystems such as suspension, powertrain, drivetrain etc. Then we developed mathematical models and 3D drawings. Engineering tools such as Ansys, solid works, math lab were used to optimize the design. During the construction, machining work was done in the university mechanical workshop by team members and CNC machine was done at the university and other industrial CNC workshops. All manufacturing including the welding was done by our team members. While Diesel & Motor Engineering PLC (DIMO PLC) provided us with the funds, workshop, tools, logistics and other facilities, I'd like to mention Southern Spars Facility in Biyagama free trade zone who provided carbon fiber materials entirely free of charge. They provide their facilities and premises to prepare all the carbon fiber parts required for the car, and the tools for the layup and the fabrication. We are really appreciative of their contribution. This year's a team of 19 was led by Lakshitha De Silva who was also the Chief Engineer – Aerodynamics. Also, our faculty advisers Dr. J.R Gamage, Mr. Sasiranga De Silva and our team adviser Mr. Rajive Wisidagama were there with us throughout the event. They’ve given us their time, effort, dedication, and so much more to make this a success. As I mentioned earlier, participating in this competition would not have been possible if it wasn't for DIMO and their sponsorships. Think about another person in the same situation as you were in when you started. Given what you know now, what advice would you give them? Being a part of this team is I think the most wonderful experience I've had in my university life. You can't simply compare the exposure and the practical knowledge you get from being an active member of this project to anything else. And also the team spirit. I consider this team my family now. This experience is remarkable when you are out in the industry. As I said we are the only team that represents Sri Lanka. And now the formula student event has become one of the most significant events in the university calendar. The industry is also watching us. Therefore as an individual, this is beneficial for your future career. How does the team push through their worst times? And how do they balance the academics and this? This is a major project that requires a full-time commitment and energy. Even though it is difficult, our team members always find time to balance their academics. And the support that we get from our lecturers, seniors and families definitely should be mentioned. Whenever we are falling behind in studies, team members themselves get together and catch up with the missed classes. But we always try our level best to keep up with both academics and Team SHARK projects. Where do sharks see themselves in five years? Our goal is to be the best formula student team and make Sri Lanka proud. The current team and the teams to come will ensure that and work harder than ever to succeed. I'm sure coming this far hasn't been an easy journey. And there has to be many people and also organizations that had your back. We’ll make this an opportunity to mention them. First I'd like to thank our Vice-Chancellor, Prof. Kapila Perera, Head of the Mechanical Engineering Department, Prof. Ruwan Gopura, Senior Lecturers Sasiranga De Silva and Dr. J.R. Gamage, and other senior and junior lecturers in department of mechanical engineering university of Moratuwa who have helped and guide us. And our Team SHARK alumni, friends, and family for their unconditional support, love, and motivation. And most importantly to our sole sponsor, Diesel & Motor Engineering PLC, for supporting us financially and operationally, and making this dream come true. A special thank goes out to Mr. Ranjith Pandithage (Chairman & Managing Director of DIMO), Mr. Gahanath Pandithage (DIMO Group CEO), Mr. Vijitha Bandara (DIMO Executive Director), and Ms. Nilushi Thenuwara (Deputy General Manager) for supporting and believing in us throughout the journey. We are here today because of them and, on behalf of Team SHARK; I want to thank them for being our pillar of strength. And a very big thank you to everyone who helped and motivated us, whom I have failed to mention today. The encouragement we get from you is what keeps us going. Thank You for being here with us today Vidura. And we wish you and Team SHARK all the very best for your future endeavors. These young men have made the country proud. They have shown us if you put your heart into something, nothing is impossible. And best wishes from Mora Mag Team for your journey towards success.